Love the amulet Mo . . . and the quote. It’s a very neat reframing of desire. I’ve never thought of desire and being anything other than a longing for something absent and that can be either destructive of positive . . . like anger, anger at injustice can be a positive force just as desire for some state can lead to a passion for attainment. Feelings just are, and, I think, we need to sit alongside them sometimes even when they are uncomfortable. Interesting . . . thanks. thanks Wendy, have been trying to make something out of that earring for a long time, it’s such a strong perfect shape that it rejected my fiddling til now! Ha! The meter could use a little help. Where’s the edit button? Rebecca Solnit’s “A Field Guide to Getting Lost” and “The Faraway Nearby” are two of my all time favourite books! 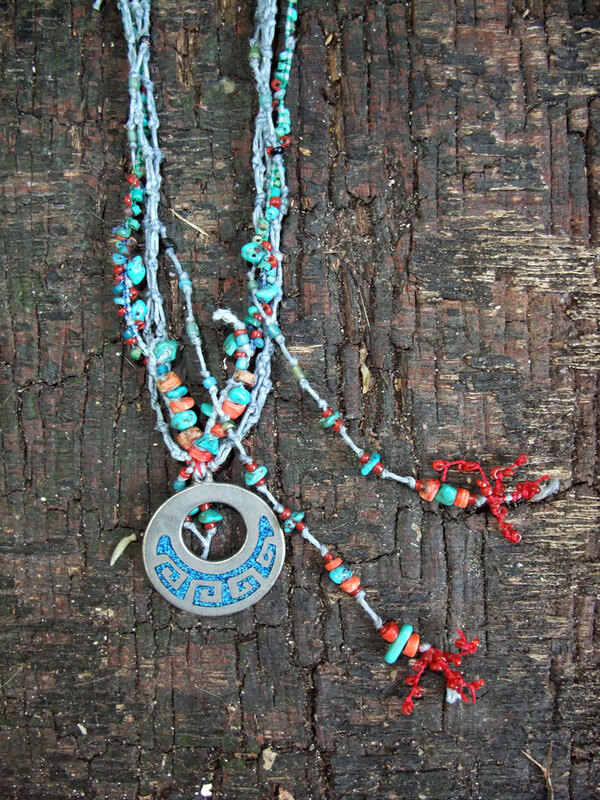 love the red tassels with the turquoise !!! Just the title of your post sent me on a meditative inner tour. The blue of distance reminds me of the blue twilight…”the blue hour”, which also has to do with longing. 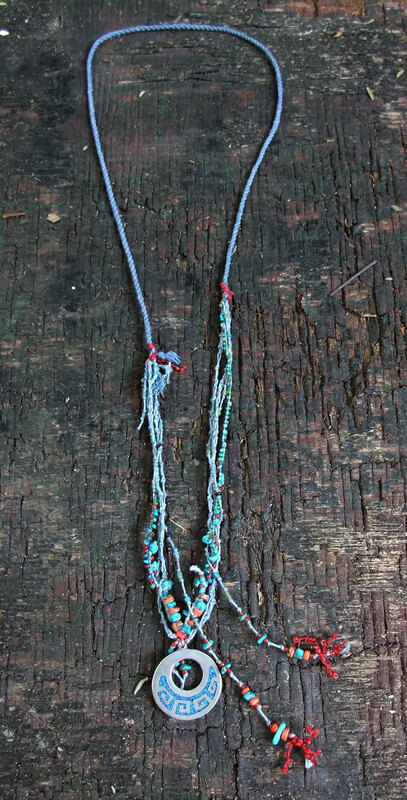 The unattained and the ephemeral are closely allied… Your necklace is wonderful. it looks great with the “Out of the Blue” talisman from 2014 & has the last of the magic blue cord Kathy Dorfer sent with her Healing White Raven! I don’t know how many times I’ve read that book & every time I find something new! Wonderful quotation, Mo, the more I read the more I find. The amulet is stunning! Very, very beautiful. It’s many years since I’ve been to New Mexico, but it really deserves to be on your bucket list. I loved it and I know you certainly would too. maybe one day but one dream I need to see in real life is The Kimberley in an October in the not too Faraway Nearby to see the boab trees in flower! (((Martine))) thanks for the good words! (((Yvette))) good to see you & thanks for the good words! how serendipitous: I have recently bought this same book…..ah you long to visit Grace as well, or perhaps you have other reasons for wanting to go to New Mexico, ha! wouldn’t it be amazing to see that desert light from Grace’s raft in real life? ooooh yes….if that would be possible. I love seeing Grace in her Crow shirt over in Windthread on this Equinox day all around the world!